Calculate the building erection costs and add the estimated 10-year heating costs and you will know that nothing beats the Izodom technology. The Izodom products comprise a set of specialized solutions with an aim to construct well-insulated underground parts of the building, outsee walls, floor slabs and roofs. A ground slab is a modern solution which ensures perfect insulation and stability of the structures used in passive and low energy buildings. Insulating floor moulded parts are a popular solution in the buildings where the floor slab needs to perform the insulating function (non-habitable attic, flat roof). Izodom offers three wall systems of varying insulation properties and thickness of outside walls. Elements of the Super King Blok system are used to erect passive houses. The outside walls with the 0.1W/m2K heat transfer coefficient are only 45 cm thick. 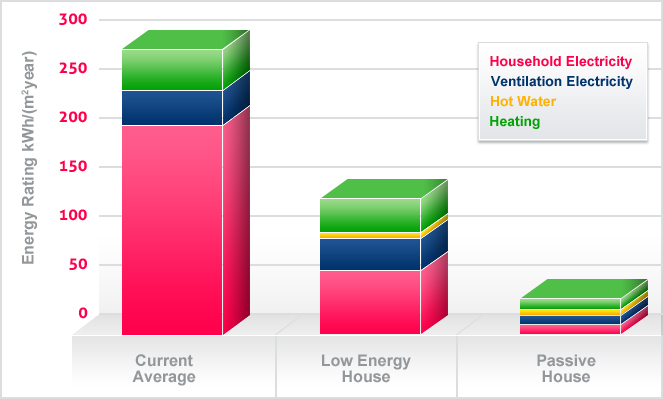 Absence of thermal bridges, low thermal inertia of the walls, number of elements which appropriately insulate the critical area in the building (floor slab, lintels, reveals) plus easy construction - all these factors make Izodom the leader among the companies providing the passive house technology. 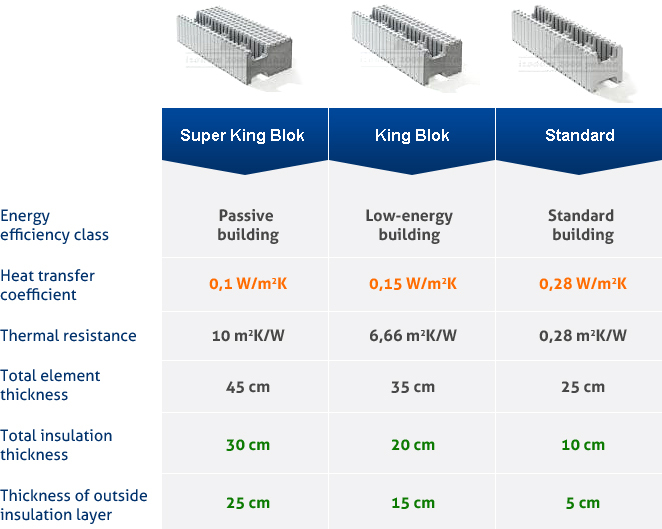 The King Blok system is used for low-energy houses. With 20 cm, uniform Neopor insulation layer, the system features low heat transfer coefficient of U=0.15 W/m2K. The wall is 35 cm thick. This solution is recommended to the investors who are interested in energy efficient solutions. The Standard system comprises 10-cm insulation elements with the 0.28W/m2K heat transfer coefficient. The system includes a set of products which ensure meeting requirements of the Polish standards related to the energy efficiency and insulation. Despite the thinnest insulation layer, the system does not have thermal bridges and insulates lintels, reveals and tie beams. All elements are made of two types of material: white EPS and grey, graphite-enriched Neopor. Thanks to special additives, the Neopor layer of the same thickness has superior insulation properties because it is the only material which retains the radiated heat. Hence, the Izodom elements of the same thickness can have varying heat transfer coefficients. The Neopor elements are "warmer".